I wish I could take credit for this; alas, it's thanks to following SomebunnysLove on Pinterest. Kimberly has incredible taste in food, and I swear I'm gaining weight just following her pins. From Chef In Training, I give you the recipe, with my two slight adjustments. The first is substituting honey for corn syrup, the second is replacing the bread with croissants. 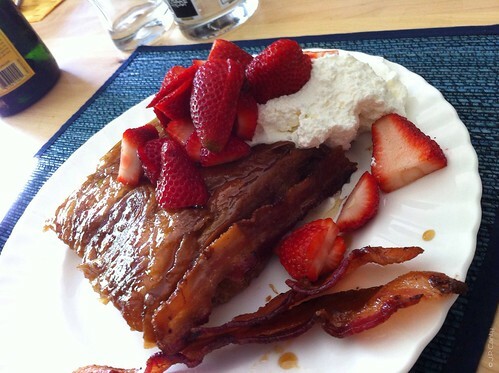 I also would recommend serving with bacon, whipped cream, and strawberries- all on the side. Mmmm. This serves 6-8 people, and next time, I'm doing two batches. That's how good this is. In a small saucepan melt butter, brown sugar, and honey over medium heat until smooth, stirring occasionally. Pour mixture onto large, greased jelly roll pan (18x13x1"). Spread around to cover surface. Cut the crossaints in half, place them crust-side down in a single layer to cover pan. Mix together eggs, cream, salt, vanilla, and cinnamon. Spoon mixture over each piece of bread. Cover and refrigerate overnight. Pull out of the fridge (about 1 1/2 hours before baking) so that the baking dish can come up to room temperature. Bake uncovered at 350 degrees for about 25-30 minutes. Remove from pan and serve. If not serving immediately, turn each slice of bread over (this will prevent bread from sticking to the bottom of the pan). Thank you so much for publishing this recipe. The site was down for repair when I tried to go there from your show note link. I desperately wanted this recipe after hearing you and GiGi rave about it!